The Fenix UC35 is the suitable flashlight for everyday carry. It has served me well since I acquired it two years ago. First of all, I like its rugged construction as I have crashed it several times but it still functions perfectly. Secondly, I like its powerful 960 lumens and distance coverage of 200 meters. I don’t have to walk from one end to another with such a bright and great throw. Also, recharging the flashlight is easy by using the Micro USB cable that it comes with. I prefer using the 18650 battery rather than the non-rechargeable two CR123A lithium batteries. Read this Fenix uc35 review article to know more about this CREE flashlight. Update Version: The Fenix UC35 V2.0 has been released this year. I have compared both version features here. 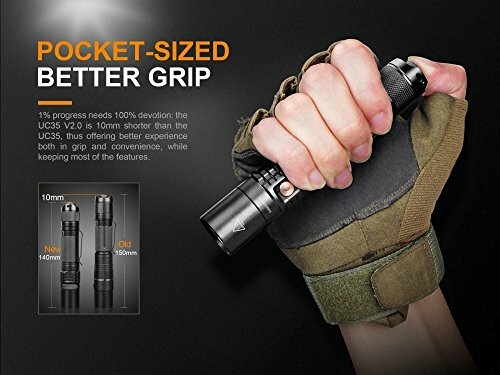 The flashlight is compact and very lightweight. So, I can keep it in my pocket or belt when am not using it or busy doing other things on the farm. The strobe mode keeps me prepared to disorient a thief or an attacker, but I have never used it to date. 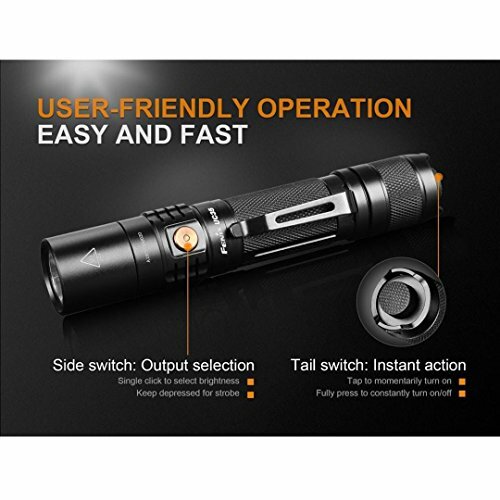 I also love its tactical tail switch which prevents accidental lighting-on of the flashlight. It also uses the indestructible LED bulb which emits white light that is able to light well even during winter when the sky is almost invisible due to the fog and snow. You can also take a look of fenix e12 flashlight. Generally, I highly recommend this fenix uc35 flashlight as it has been what I have been looking for. 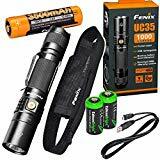 4.1 Why use the fenix uc35 rechargeable flashlight? Being a poultry farmer, I have to check on my poultry from time-to-time just to ensure that they are safe and sound. I always make rounds around the fence at night using the fenix uc35 to inspect if a predator has broken into my farm or not. Before I bought this light, the flashlight before didn’t last long. But this one has stood the test of time and continued to provide me with a great source of light to keep watch of my investment. Why use the fenix uc35 rechargeable flashlight? Today’s quality flashlights come with LED bulbs. These bulbs have a longer lifespan of 50, 000 hours and cannot be easily destructed. They can defy impact and offer bright white light. The Fenix uc35 rechargeable light uses Cree XM-L2 U2 LED bulb. 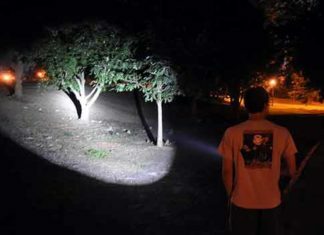 It provides a maximum of 960 lumens and a beam distance of 200 meters. Furthermore, the flashlight has 5 different lighting modes and a strobe mode. The Eco mode has the lowest lumens at 14 and runtime of 150 hours, while the turbo mode has the highest lumen at 960 with a runtime of 1 hr 30 minutes. For bright light, you can select either the turbo or high mode. The strobe mode is for disorienting assailants. It is easy to use this flashlight. All you have to do is to unscrew the tail cap and insert the battery. Put back the tail cap and switch on the light by pressing the tactical tail switch with momentary on function. To change modes, press the side switch on the head. You will have to cycle through different modes to attain the mode that you want. To switch the light to strobe mode, press and hold the switch for one second. Again, to return to normal lighting, press once. If your job involves hardships, crashing or working in tough conditions, then you need a tactical light that can survive such toughness. The fenix uc35 960 lumen light is built for tactical use. This is because it can withstand impact of up to one meter. Its body is made of anti-roll and slip design. It is also waterproof up to 2 meters underwater for 30 minutes with its IPX-8 ratings. So, you can use it in your work area or outdoor, no matter the weather condition. The flashlight offers two battery options. You can decide to use the rechargeable 18650 lithium ion battery or 2 3V CR123A lithium non-rechargeable batteries. I prefer one 18650 Li-ion battery as it can be recharged using the micro-usb included in the purchase. Also, the rechargeable has a longer run time and is more reliable. I hate lights that don’t come with features that protect your investment. 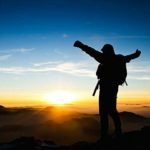 Many flashlight lovers spend a lot to just acquire a quality flashlight. But some don’t have protective features and flashlights end up spoiling quickly than expected. This led flashlight is safe to use as it comes with a reverse polarity protection to prevent bad battery placement. Also, it has a low-voltage warning function that enables the user to know when to recharge the battery. Also, the over-heat feature prevents the flashlight from overheating by adjusting the light mode to a lower one. The Fenix uc35 is made by a reliable brand and comes with a warranty. The fenix uc35 flashlight is a quality and featured packed light. But just like any other great light, it also has its own shortcomings. The flashlight has a switch that is a bit tricky to use. For the flashlight to be switched on/off, the user has to hold the switch for long before light comes on. Many users have found this feature to be disgusting as they prefer a light that switches on/off on the go. Another disadvantage of this flashlight is that it tends to overheat when used on the turbo or high mode for a long period of time. To prevent this, you will be required to adjust the modes after 15 or so minutes. For reliable and uninterrupted light, the Fenix uc35 is the way to go. This small but powerful flashlight has the ability to cover a distance of up to 200 meters on 960 lumens. It has 5 different lighting modes with strobe modes included. These can be applied in different settings and use. The flashlight is sturdily created for tactical use and has the ability to defy water and impact. On top of that, the manufacturer offers warranty on the product and it is offered at such a great price. 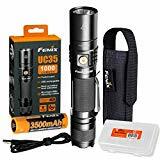 If you are an outdoor enthusiast, work in dimly lit places, or just want a quality flashlight for your everyday lighting needs, the fenix uc35 is a quality LED light to have. I hope this Fenix UC35 review has given a clear idea about this flashlight.